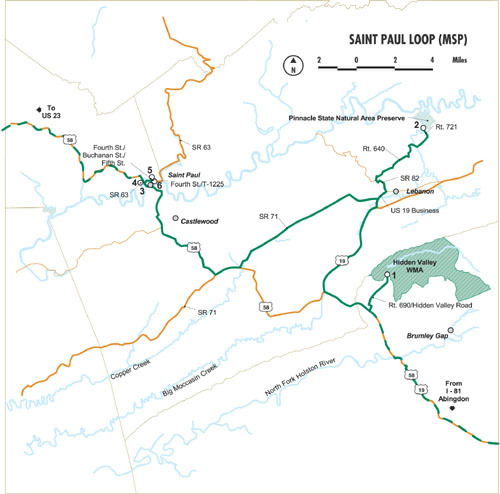 The Saint Paul Loop offers six excellent sites in proximity to the Town of Saint Paul. Included in this mix are state and city lands likely to be productive for wildlife watching. The loop variety includes both extensive areas and relatively small venues. Wetlands, montane and woodland habitats can be found on this loop. Elevation ranges vary, with Sugar Hill Loop Trail climbing above and providing a stunning view of the Clinch River Valley. The Pinnacle towers above Big Cedar Creek and is surrounded by a fragile ecosystem. There are several species of rare and endangered species resident here, including the magnificent but elusive hellbender.